is never really a good idea. This seems to be my one opportunity though, so here I am. I came to beautiful San Fran last Thursday and have been buried in work these past five days. My, how I miss this community when I away from it. Lucky girl that I am though, I mentioned to a new buddy in craft blog land where I was traveling and she happens to live right here...not even too far from my hotel. Lucky me. Sonya and I got to meet yesterday. Lucky me. To spend an evening with this new friend, this creative soul who is every bit as charming, funny, beautiful and interesting as I had imagined her to be from reading her blog. Oh, but she says it all so much better here. Lucky me. She not only gave me the beautiful gift of her friendship, but she also brought me a present. 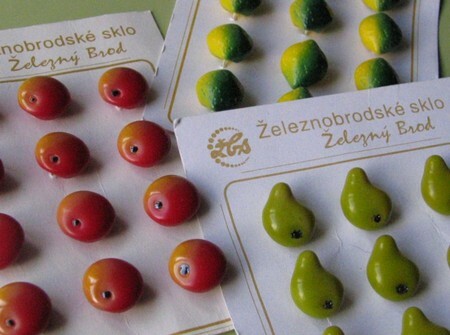 Gorgeous vintage fruit buttons from Czechoslovakia. There is nothing in the world like making this kind of connection. We both agreed that Mimi really says it best here when talking about how easy it is to meet fellow bloggers. It was wonderful to meet you!! Thank you for a great time Sonya! 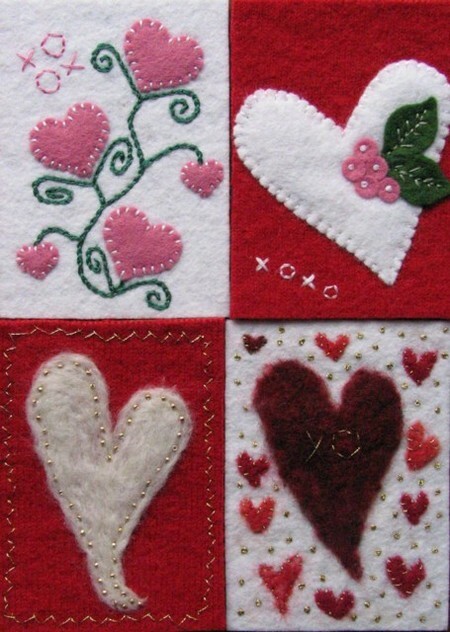 In my down time from work, I like to work on projects up in my hotel room and managed to finish my ATCs for Amy's Valentine ATC Swap. 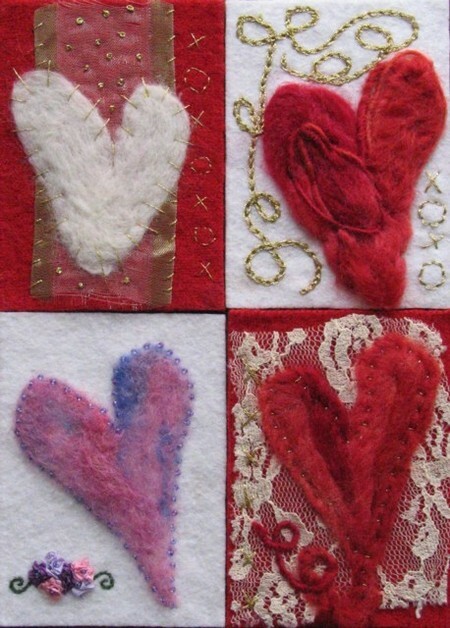 What fun I had playing with embroidery, felting, beading...I used remnants of old sweaters and leftover pieces of trim and lace, beads and silk ribbon. We are to trade in five and I made eight since I was having such a good time experimenting with different combinations. There is another project keeping me busy. Hope to have something to show before too long. Good night.